Those who enjoy tennis in the Conway area have a new venue. 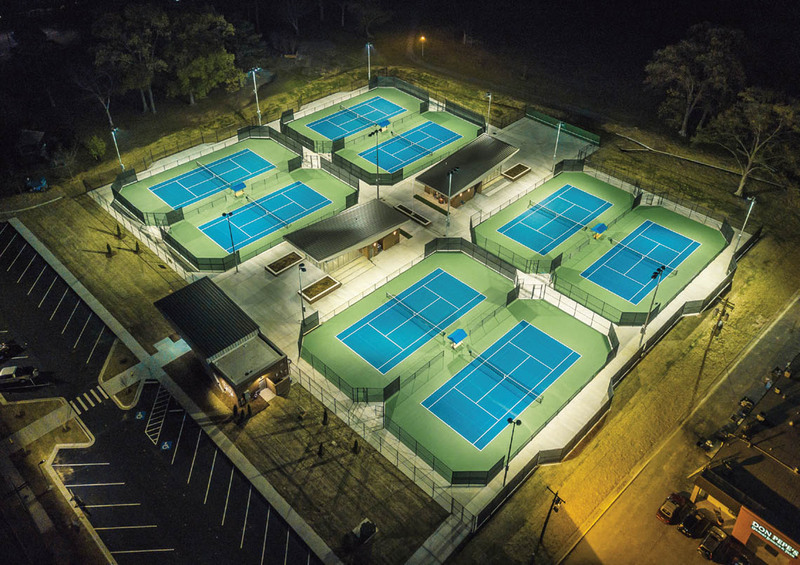 Last spring, the City of Conway completed construction on the Conway Tennis Center, an eight-court outdoor complex at Laurel Park. The center, accessed from Prince Street, features a 1,400-square-foot pro shop building with reception area, two 1,200-square-foot pavilions with heated and cooled indoor viewing areas and outdoor seating for spectators. “A few years ago, we started working with the city to let them know how many tennis players there were in Conway and that there was a need for something like this,” said Conway Area Tennis Association Vice President Christian Lenderman. Prior to construction on the $2.5 million-dollar project that began in August 2017, the city debated on various locations in Conway but landed on a brand new facility at Laurel Park. Old tennis courts were removed to make way for the new center. Corco Construction was the general contractor. To ease accessibility and increase participation for nearby Conway High School, a crosswalk has been installed across Prince Street. Completed in April, the complex held its first tournament, the Conway Regional Tennis Classic, just two weeks after its opening. “Conway Regional really stepped up to the plate to be our major sponsor for our first tournament,” Lenderman said. “Combined with a grant from the Conway Convention and Visitors Bureau, we were able to put on an outstanding tournament. With around 200 participants, we held one of Arkansas’ largest tennis tournaments for our first one. Recently, the United States Tennis Association named the event as Southern Tournament of the Year. Besides the Conway Regional Tennis Classic, the CTC has held various events, including a sanctioned Junior Tournament, the Young Life Way to Serve fundraiser and the Ladies Santa Claus Mixer. The next event will be the SEC Challenge Calcutta scheduled Friday, March 1, through Sunday, March 3. With a successful first tournament in the books and increased interest in the sport, the Conway Area Tennis Association continues to imagine possibilities for the growth of tennis throughout Conway with more events and school outreach efforts. The Conway Tennis Center is open to the public. Courts are available for reservation by calling 501.499.8555. For more information about the Conway Area Tennis Association, visit conwaytennis.net.